Broseley provide an extensive choice of stoves with options to suit your home. Whether you have a traditional brick chimney, pre-cast flue or no flue at all, we have a stove to fit. For those situations where you have no chimney or flue, our balanced flue stove are ideal for venting directly through an outside wall. If you’re unsure which stove you need, contact one of our Broseley retailers who will be happy to survey your property and provide professional guidance and advice on which Broseley stove is right for your home. All gas stoves or fires require a chimney or flue to conduct expended gases to the exterior. 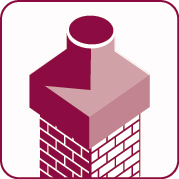 If you are still unsure of what chimney or flue you have, please ask for assistance from your local Broseley dealer. Easily recognisable from the stack above the roof line (usually with a pot or gas terminal). Once the stove is flued into the chimney cavity, any harmful gases are expelled up the chimney itself and out of the roof. Any of our multifuel, woodburning or gas stoves can be installed here. 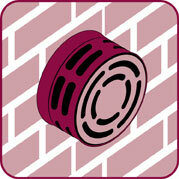 Identified by a round flue installed directly through an external wall or the roof. Our balanced flue natural gas stove is completely sealed from the front, allowing air to circulate through the flue to the rear of the fire. Cold air is sucked into the fire to combust and the gasses are expelled via the same point. If you don’t have a chimney or the available space for a flue, we have an attractive selection of electric stoves which provide the shimmer and smoulder of a real stove but in it’s most convenient form, and the only installation needed is a plug socket. Also see our inset electric stoves that fit into a regular fire opening in a fireplace.